Coloplast Sween 24 Cream, manufactured by, Coloplast is a medicated cream designed for moisturizing and soothing irritated, dry, chafed, chapped or flaky skin. Lotions and creams are used to soothe, protect and moisturize the skin. Common skin conditions can cause burning, itching and irritation. Left untreated these symptoms can prolong the skin discomfort and advance to more serious skin conditions. The use of a skin lotion or cream with the proper active ingredients can help to provide temporary relief and protection of these symptoms. Coloplast Sween 24 Cream is available for SALE from Vitality Medical. This cream is medicated with dimethicone. This medication can help to reduce dry, chafed or chapped skin. This active ingredient soothes the skin and keeps it moisturized. Keeping the skin moisturized can help speed up the damaged skin healing process and provide soothing temporary relief. This product is fragrance, petrolatum, lanolin and alcohol-free allowing you to worry less about possible allergic reactions to foreign chemicals and additives. An additional benefit of the Coloplast Sween 24 Cream is it's once-a-day application. Lotions and creams requiring constant application can be inconvenient and costly. The active ingredient in this cream allows for a one time daily easy application that lasts for the whole day. 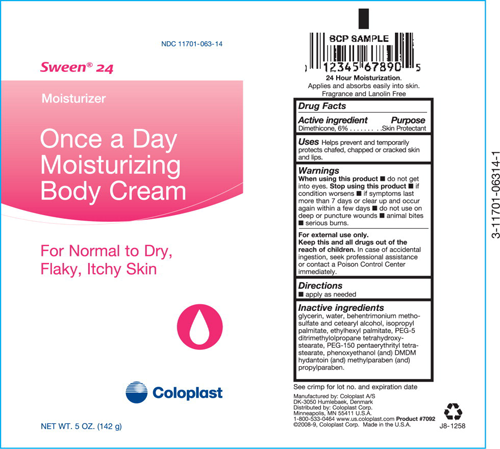 According to Coloplast Sween 24 Cream is safe for neonatal use which could be useful for effectively treating infants or toddlers with dry skin conditions. This cream is CHG compatible and available in various sizes to fit your needs. 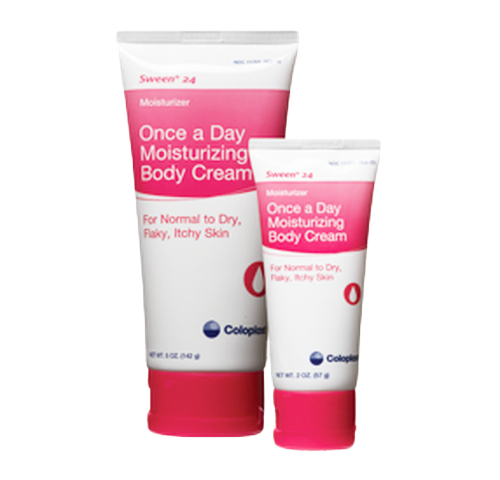 BUY Coloplast Sween 24 Cream from Vitality Medical today. Can this kind be used for bed sores just red its on her tailbone ? Which kind sween creme? We do not employ any medical professionals and therefore cannot answer any specific questions regarding this item. It's best in this case to contact your physician for a clearer answer. What store can I buy Sween 24 Cream at? We have a single store location in Utah. We can ship anywhere in the U.S. as well if you decide to place your order through our website. I have been using this for several years now. I got it from my sister who got it from the hospital. She ordered it and gave me a tube. And now I get my own supply. I have very dry skin and it is a great moisturizer. Love the product. My husband was given a tube of this while in the hospital. I tried it and there is no other cream like it. I used it all and ordered another larger tube. My hands and arms feel like silk and I only use at night before I go to bed. Thanks for a wonderful product. Found this product at the hospital. Looked online and ordered many units to share with friends and family. It came within a couple of days. It is by far the best hand cream I’ve ever used and it subdues my topical dermatitis back better than prescription meds. The fact that the price of the product and shipping is icing on the cake. Great product. I learned about this product on a visit to an Emergency room at a local hospital. I was given a tube during my stay. I enjoyed it so much I had my husband see if he could find where we could buy some. He was able to and I am so glad because I think this is a really great product. The reason I bought this product is because I does wonders for my skin. Your delivery was prompt and well received. My father has always had a problem with dry skin ,itchy skin. After using this product in a skilled nursing facility, the dry itchy skin ceased, and his skis remains moist and looks beautiful. Caregivers and nurses can hardly believe their eyes! As a result, I started using it, and I have been very satisfied. Product was delivered quickly. Shipping was reasonable. I love this product, but had a hard time finding it. I was excited to find a company I could buy it from. Best Moisturizing body cream we have ever used. Product was delivered on time and also got it for a great price!